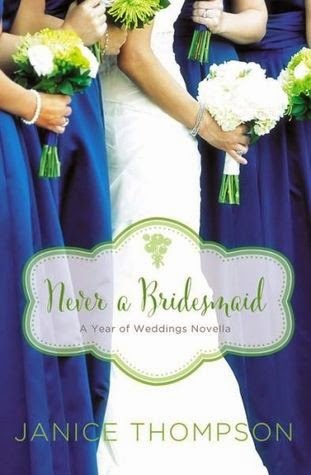 Can one bridesmaid undo the disasters caused by a poorly chosen maid of honor and save her sister’s wedding from disaster? Mari’s older sister Crystal is getting married, and Mari is one of her bridesmaids – actually, the last in a lineup of five bridesmaids, but that doesn’t really bother her. Much. But Sienna Jameson as the maid of honor? Really? She might be Crystal’s best friend, but she’s ditzy and undependable on her best days. When the best man turns out to be hunky Derrick Richardson, the right fielder for the Houston Astros and one of Houston’s most eligible bachelors, Sienna abandons her duties as maid of honor to chase Derrick, and it’s up to Mari to make sure Crystal’s wedding day goes off without a hitch. While Mari is wrapped up in dress fittings, bridal showers, and bachelorette nights, Derrick has taken notice of her devotion to her sister and her determination to make the wedding perfect. But between dodging Sienna’s advances and watching Mari running around like a madwoman, Derrick is left to steal moments whenever he can to get to know this beautiful bridesmaid. When the maid of honor shows up to the ceremony late and more done up than the bride herself, Mari fears her attempts to make her sister’s wedding perfect have all been for naught. Will the bride be up-staged by the maid of honor? Will the fifth-in-line bridesmaid ever be recognized for all the work she’s done? And will Mari finally have a moment to revel in the magic of a wedding and dance in the strong arms of a man? Janice Thompson never fails to deliver when it comes to fun, humor and sweet romance. That is very much the case in the latest Year of Weddings novella. I loved the characters in this book, from sweet Mari to handsome Derrick and everyone in between. I feel like I absolutely gushed over this series last year and I'm doing it again this year, but I just can't help it. I'm a sucker for a well written romance and Janice Thompson has never let me down.